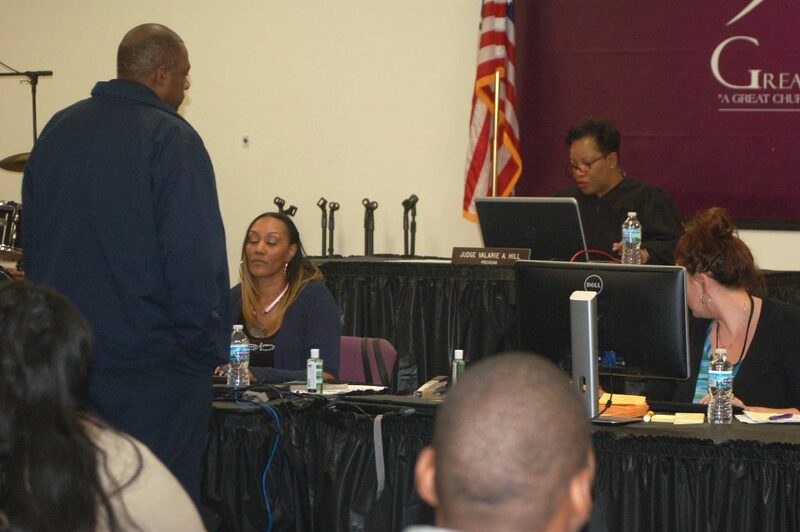 A defendant comes before Municipal Judge Valarie Hill in a meeting room converted into a courtroom at Greater New Birth Church, 8237 W. Silver Spring Drive. Photo by Edgar Mendez. 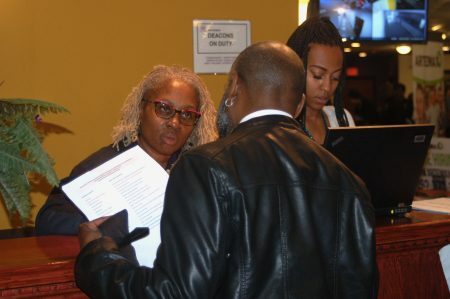 The Greater New Birth Church, located at 8237 W. Silver Spring Dr., was transformed into a temporary courtroom during the second “Warrant Withdrawal Wednesday” event, sponsored by Milwaukee Municipal Court last week. The first set of “Warrant Withdrawal Wednesdays,” which took place on three consecutive weeks in November, helped more than 1,500 defendants clear warrants, while 1,048 had their driver’s license suspensions vacated. According to City of Milwaukee Municipal Court Judge Valarie Hill, half of the 2,400 people who set up payment plans in November have been compliant so far. “This one comes with a twist,” Hill said. After a brief court hearing, defendants were able to meet with officials from the Wisconsin Department of Motor Vehicles (DMV), get help writing a resume, sign up for a job training program or even get a job, with some employers looking to hire on-site. Malissa Cooley, a representative of Greater New Birth Church, said the event was an opportunity to build up the community. “A lot of times when people have warrants or don’t have licenses their lives stagnate. Getting all that cleared up and being able to find a job helps them move forward,” Cooley added. A Wisconsin Department of Motor Vehicles official fields questions from an attendee. Photo by Edgar Mendez. Unlike the three Wednesdays in November, when capacity was unlimited, the most recent event was limited to the first 256 attendees who pre-registered by calling a hotline set up by the Municipal Court. According to Hill, the number was limited because regular court sessions were still being held at the courthouse downtown and because the judges wanted to expedite the process for those who registered. During the court hearing, defendants who had their warrants lifted were given three options. They could choose to set up a plan to pay a minimum of $20 a month by mail, online or over the phone, or $20 every three months at the Municipal Court building. The other option was for defendants to inform the judges that they are indigent. Those who said they couldn’t afford to pay were immediately referred to JusticePoint, which was on site. JusticePoint is a program that helps evaluate individuals to determine whether they qualify for indigency, mental health, or alcohol and drug treatment, among other services. After the November warrant withdrawal event, aldermen and court-watchers raised concerns over whether the court does enough to identify individuals who can’t afford to pay their fines and qualify for an indigency hearing. According to data collected during the first warrant withdrawal event, 109 individuals, or 4.5 percent, were referred to Justice 2000. Hill told the group gathered for the first round of court sessions that if they couldn’t pay their fines they needed to inform the court when their case was called. Gretchen Schuldt, executive director of the Wisconsin Justice Initiative (WJI), said she was pleased to learn that attendees were informed of their right to an indigency hearing at last week’s event. “We hope they’re informing each and every defendant of their rights, all the time,” Schuldt said. According to Linda Hitz, service coordinator for JusticePoint, individuals were quickly screened and then given an appointment for a later hearing to determine whether they qualify for community service or other options offered through the program, in lieu of paying fines. Once individuals completed the court proceeding, they were encouraged to take advantage of the additional resources on hand. Timothy Gray, who saw a Facebook post about the event and quickly registered, said he was happy he did. “Man, it feels good to clear up and get my [license] back,” he said, while standing in line to meet with DMV officials. According to Sheldyn Himle, chief court administrator for the Municipal Court, DMV officials provided attendees with information about reinstatement fees, vehicle registration, how to obtain a license and whether they had overdue fines in other municipalities. The judges haven’t decided whether there will be similar warrant withdrawal events in the future, but Branch 3 Judge Phillip M. Chavez, who also heard cases Wednesday, noted that people who have municipal warrants or driver’s license suspensions don’t need to wait for one. “You can come to municipal court anytime during regular hours and take care of these issues the same way we’re doing it here,” Chavez said. This is really good to see. A great creative idea. Love this. Let’s do it in other cities.